The second step to 5S is known as Seiton, or Set in Order. For this phase you will take the items you deemed essential in the previous step and place them back into the workstation in a well-organized manner. 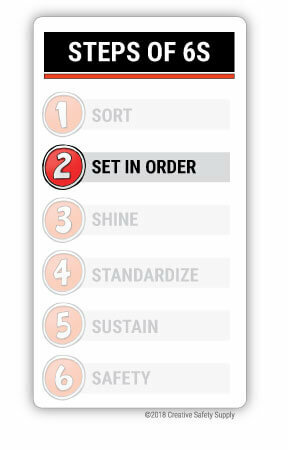 It is important to begin the Set in Order step of 5S only when the Sort phase is complete. Otherwise, this phase will be ineffective if there is unnecessary clutter still in the workspace. 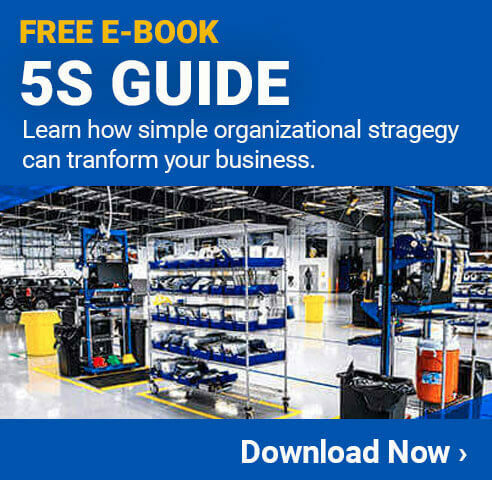 The goal of Set in Order is to create a standardized and consistent way to store and retrieve tools and materials; the key here is standardization. Each item being returned to the workspace will be placed in a “home”, a specific and logical spot within the area. If items are used together, store them together. Put frequently used items closest to the user. If possible, devise a let-go system in which tools are attached to a retractable cord and automatically go back to the stored position. Place items so the user doesn't need to bend or twist much to access them. Arrange tools and materials in order of use. Another important component to the Set in Order step is to consider the worker; a goal of this phase is to minimize the need for workers to repeatedly bend or reach over between items. Instead, tools used on a day-to-day basis should be kept close to the operator and less utilized items and be put in other areas. The Set in Order step utilizes several strategies to accomplish its goals and one of them is called shadow boarding. Essentially, the tools being organized are traced and cut out of vinyl, and the vinyl outline is then placed in a tool drawer or on a pegboard. This way, when employees are returning an item back to the area, they can immediately identify its home.